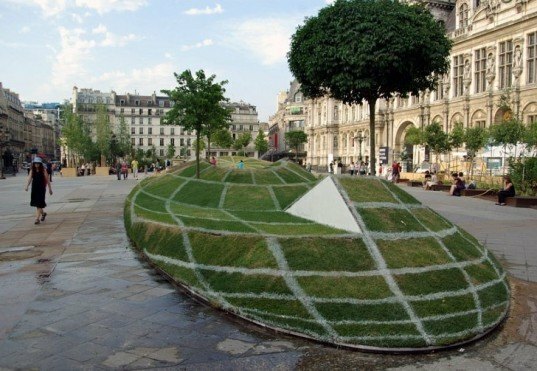 Incredible Grass Globe Illusion Pops up in Paris! Admit it - weren't you a bit fooled by French artist François Abélanet's grassy 3-D anamorphosis optical illusion seen above? Called "Qui Croire?" and installed on a flat part of the lawn in front of Paris City Hall, the installation consisted of 600 cubic meters of sand and hay that were made to look like a giant sphere from a certain angle. The project, whose title means "Who to believe? ", was meant to cut past the constant chatter that obscures environmental issues. Installed by 90 people over a five day period, the incredible optical illusion is 100 meters long and takes up 1200 square meters of lawn. It is covered in 300 square meters of sedum. Designed to rise above the heated rhetoric of scientists and builders and other stakeholders, Qui Croire? invites people to simply question the role that nature plays in their lives. 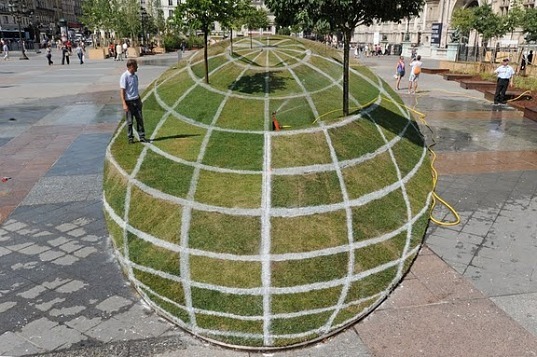 The public will be able to visit this mind-bending land art project at Paris City Hall until 15 July, 2011. This land art exhibit is a 3-D anamorphosis. Using sand and hay, the artist made flat land look like a giant sphere. On show at Paris City Hall, the exhibit was realized in response to a constant but obscured chatter about environmental issues. Qui Croire - the name of the installation - means "who to believe?" The artist asks the visitor to question for themselves the role that nature plays in their lives. This land art project entailed a mammoth undertaking. 90 people worked on it for 5 days. Constructed amidst the city garden, it used 1200 square meters of lawn. It is 100 meters long, and was covered in 300 square meters of the sedum. It will be on view until 15 July, 2011.